One of the most memorable moments from the 2014 Oscars — besides Ellen DeGeneres' famous star-studded selfie, of course — was unquestionably the Adele Dazeem incident. When John Travolta took the stage to announce Idina Menzel's performance of "Let It Go," he completely mangled her name, leaving the rest of us in a state of total confusion. What just happened? Why couldn't he read a cue card? And, most importantly, why wouldn't he be familiar enough with the Broadway legend when he's not exactly a stranger to musical theater? Fortunately, this year's Oscars gave John Travolta a chance to redeem himself, and my expectations were pretty high. No way would he mess up two years in a row, and I even had my fingers crossed for a joke or two about what happened the last time he was on that stage. So what happened in round 2? It far succeeded those high expectations I was just talking about. Before John Travolta came out to present, Idina Menzel walked on stage to introduce him... as "Glom Gazingo." He then went on to prove that he does, in fact, have a sense of humor, and let Menzel make all kinds of jokes at his expense. "It's not like that's going to follow me around for the rest of my life," she quipped before asking him if he'd like her to read off the nominees for him to avoid any gaffes. 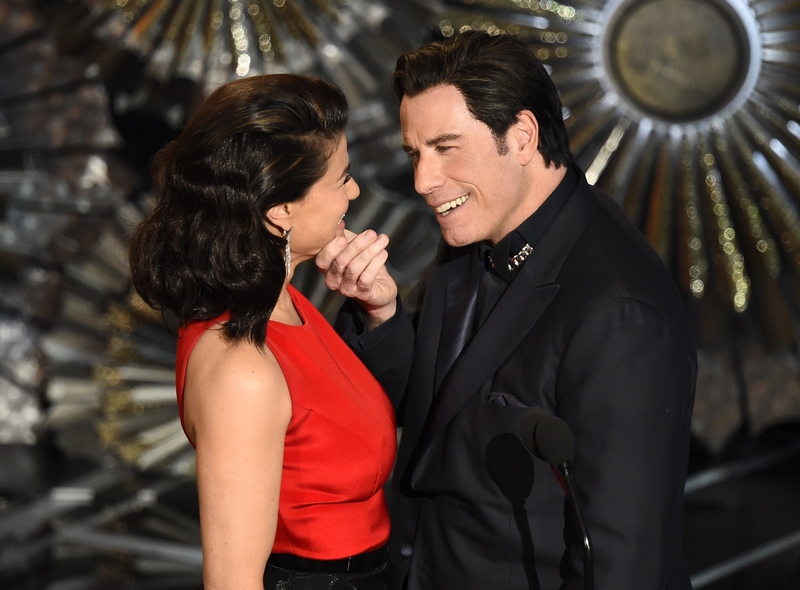 And, of course, Travolta pulled it off flawlessly — without a single mistake or mispronunciation! Adele Dazeem, dare I say, you're officially a thing of the past? I'm happy that both of them managed to treat the issue with such grace and humor, especially because neither of them are guilty for any part of the (admittedly hilarious) media storm that followed Travolta's flub last year. If we could make this a tradition for Travolta and Menzel to team up at every Oscars for old times' sake, I'd totally be OK with it. You know, minus the whole creepy Travolta element.